A few notes on the March job numbers, which the GOP has been touting for the last 24 hours. This is a continuation of the Obama era recovery. Furthermore, the biggest growth sector was the healthcare industry, with strong hiring in ambulatory care, hospitals, and nursing and residential care facilities. What happens if Trump and the GOP AGs win their lawsuit to declare the Affordable Care Act unconstitutional, throwing 20 million people off of health insurance? Those healthcare jobs will disappear fast. And the economy? The manufacturing sector lost jobs due to Trump’s trade war. Leisure and hospitality jobs are low-paying. 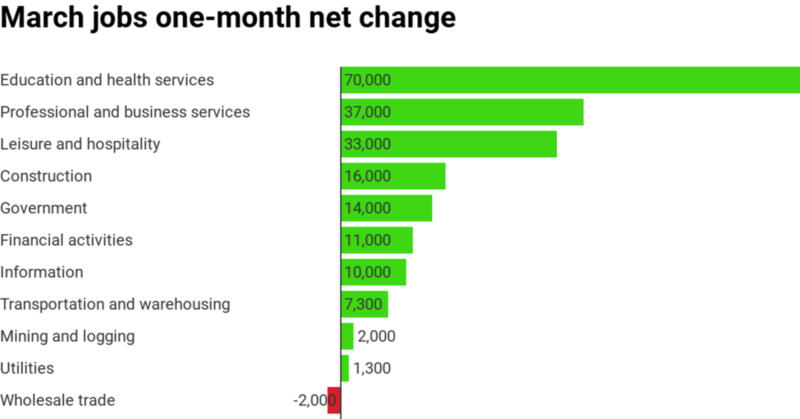 Construction jobs are seasonal so there was an uptick in March as the weather improved. The stock market didn’t receive this job reports with applause. Posted in Latest News, Talking Points and tagged economy, Healthcare, jobs.